After getting your Moto G 2nd Gen (Moto G 2014), you should try to get familiar with the Moto G layout, e.g., the location of the buttons, the functions of each accessible port. Please note, this page is for Moto G 2nd Gen (aka Moto G 2014, including Moto G 2014 with LTE). The Moto G layout for other models is different. The front view of Moto G layout is illustrated below. LED indicator, for charging and notifications. Micro USB port. It can be used to charge Moto G, to connect Moto G to a PC, or to connect a USB OTG device. 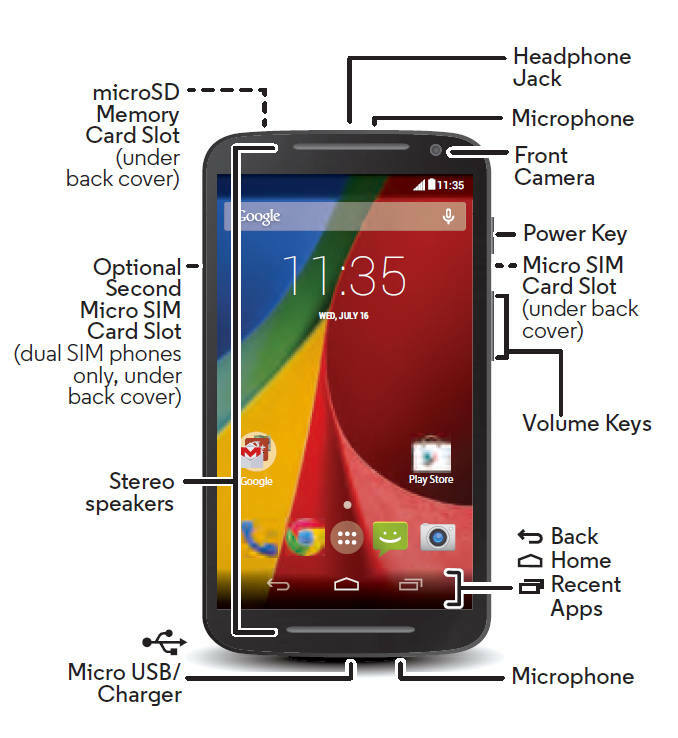 For Moto G 2nd Gen (Moto G 2014), Micro SD card is supported, the SD card slot is under the back cover. In other words, you need remove the back cover to access the SD card slot. Similarly, the SIM card slot is also under the back cover and you need remove the back cover to insert the SIM card. MicroSIM card is used on Moto G. Please try to get the correct size of SIM card from your carrier. For dual SIM models, both SIM card slots are under the back cover. Please refer to this guide on using dual SIM cards on Moto G.
Moto G layout is simple. There is no physical Home button. Home button, back button and Recent apps button are implemented on the touch screen as software buttons. Do you know Moto G layout for your Moto G 2014 now? If you have problems or questions on Moto G layout, please leave them in the comment box below. Since I bought it about 5 years ago, my motoG3 home screen had a 2-wide 4-high Google schedule that I really liked. Yesterday it disappeared, and i can’t find it. It doesn’t show up as a midget. Any ideas? Is it Google Calendar widget? The time, WiFi etc at the top are now on the left rather than right side and the back signs etc at the bottom of the display are now now reversed as are WhatsApp commands. Very confusing. Is there a remedy please? Did you remember what you did before it turns to this? Installed any apps? Changed any settings? Anyway, if you messed up the phone, your may back up your data on the phone and try a factory data reset. my moto g 3rd gen now no longer displays a swipe pattern or, if used a PIN entry box on powering up and the homebutton no longer works. I have wiped the cache partition using the power/volume control instructions and it still does not work. Any ideas? If home button doesn’t work, you probably have to back up the phone and try a factory data reset. I have a Moto G with Kit Kat 4.4.4. There is an “H” appearing to the left of the signal bars in the top status area. I can’t seem to find out what the “H” stands for in the User Guide. I have had nothing but trouble with this phone. From over heating ( not from charginging it, I was told they really don’t know what the cause is) to having the charging port on the phone eventually sink into the phone. I am not hard on my phones nor do I force tthebcharger into the phone. This has happened on both of the phones I’ve had, about a year after I have had the phone. I have had other brands of phones and this never happened. I have noticed that when the port is on the side its less stressful on the phone. No more moto Gas for me. Also when I bought the phone no onenat boost told men there was a16 GB available or that the 2nd generation was on its way out. Also I never got the lollipop update of 5.0. This all just happened…promises promises! !